What Can Census Records Say About Your Family? Census records are important for many reasons. Genealogists were super excited when the 1940 census data was released because of the potential that it contained information they needed (and had no way to access before that release). There are many things that census records can say about your family. The National Archives points out that census records can provide the building blocks of your research, allowing you to both confirm information and to learn more. MyHeritage points out that census records (worldwide) can also include marriage information, military service, and more. Some countries recorded religious affiliation. Census records can reveal information about the daily lives of your ancestors that can be added to your family tree. Families can be traced from each census over the years, and often from location to location throughout the country.MyHeritage has 94 census collections, containing over 1 billion census records. Their earliest census records date back to 1657. 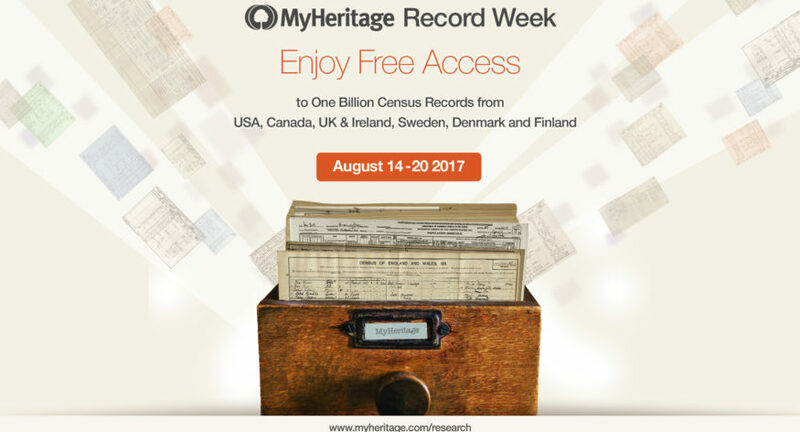 MyHeritage is offering free searching and viewing of their major census collections from August 14, 2017 through August 20, 2017. This covers more than 1 billion census records from the U.S., the U.K., Ireland, Canada, Sweden, Finland, and Denmark. This offer is available to users of MyHeritage as well as people who have never used MyHeritage before. 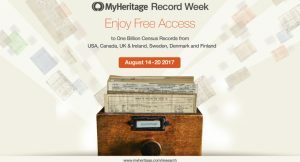 Here is a quick look at the records MyHeritage is offering for free (for a limited time). These records will remain available for MyHeritage users after the “freebie” offer expires. It is worth noting that a MyHeritage Data subscription is still required to view records from other collections, and for saving records to your family tree or confirming Record Matches with any collection.